F. Kenya was born in the Ghanaian town of Asima in the Eastern Nzema District. Trained as a goldsmith, he started singing in the mid 60’s with the Ahamanos band and later joined Kaikaiku’s No. 1 band before going out his own in the late 70’s. He was one of the first popular singers to sing in his native Nzema language and the energy in his vocals and performances made him very popular in Ghana and neighboring Ivory Coast. A few F. Kenya tracks have appeared in the Gun and Guitar compilations Vol 1 and 2 put out by John Booker, but nothing else has been available in the West. 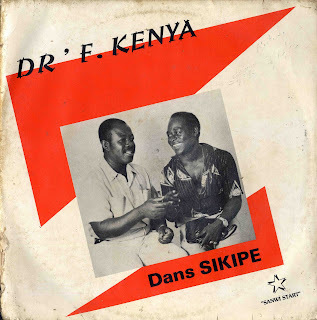 F. Kenya moved to the Ivory Coast in the early 80’s and did a number of LP’s, including this one. The track is called en sejames (dans sikipe). I like this track because the frenetic energy of the music and the raucous call and response structure of the song really showcases F. Kenya's amazing vocals. The song really starts to cook after the 4.17 mark when F. Kenya starts shouting about Life. I've got the same lp you used as avatar so no need to explain why I'm happy to find some other music by this great artist... I recently caught a serious (but delicious) ghanaian virus, I'll be around! nice-i love it-but how can i get it?can i download? I apologize but the tracks are not downloadable. The LP does comes up for sale on ebay from time to time and goes for around $60. I am glad you liked the music.